Budgeting 101 - Lydia, Inc.
What is a budget? What does it mean to budget, to save, to keep, to spend? What is a working budget? How do we overcome our debts? Manage our money? Survive without food stamps and survive with food stamps? Pay for medical bills? There are many financial calculators and budgeting blogs available. The information and resources are innumerable. Find what works for you, the reader, and use it. For this project, you’ll need your paycheck, food stamps amount, social security checks, and child support. If you don’t receive those, or if you receive other sources of financial assistance, adjust the budget for your resources. 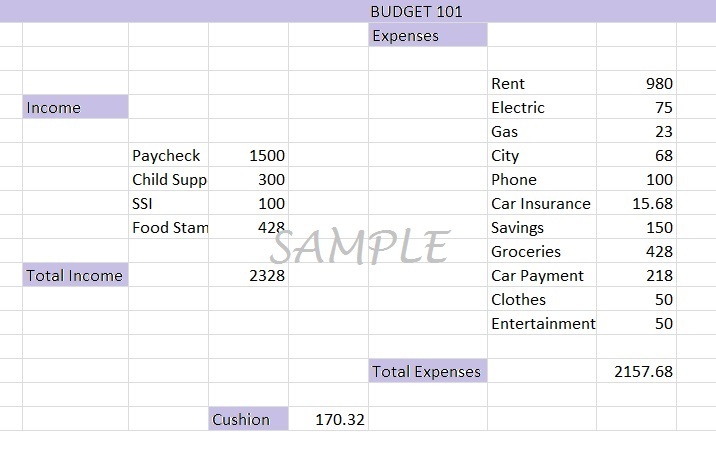 In the sample budget we used a 10% formula from the paycheck for our savings amount. We didn’t save anything from our food stamps (which we will address in a few moments), or the child support and social security checks. We want to save from the paycheck as much as possible. The child support should be used for supporting your child(ren), including helping pay rent (housing), necessary clothes (let’s not have our children run around in their birthday suits, please – and a necessity is a pair of shoes that doesn’t have to be name-brand, properly fitting underclothes, etc. ), extracurricular activities, tutors – necessities. Your social security checks should also go to pay for your living and medical expenses such as copays and other fees. The “cushion” noted at the bottom is for unexpected expenses and for monthly bills that aren’t otherwise addressed. Now, what about your food stamps? Best practice? Buy what you need. Stock up on fresh fruits and vegetables, healthy snack options for your children, and your regular meals. My family prefers to do once-a-month bulk shopping and buy what we need from there. So we’ll spend $250-$300 at the beginning of the month and then buy bread, milk, cheese, sandwich meat and cereal as we run out of it. We buy extras of what we know the family will eat so if we’re running low on what we enjoy and need, we’re able to reach into the recesses of the pantry. This discussion isn’t about meal planning, a topic we’ll address in future, but I do want to say that it is important to meal plan and buy what your family will eat. What are some tips and tricks that you’ve learned to use for your family? What are some of your favorite budgeting workbooks, websites, or programs?